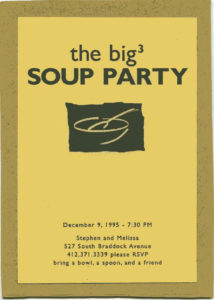 Thank you for celebrating 25 years of Big Soup with us. 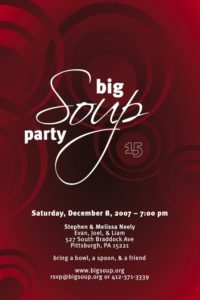 The event raised $5,000+ for the Greater Pittsburgh Community Food Bank. 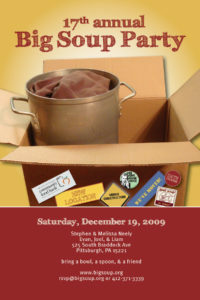 We had 50 Gallons of Soup: Potato Cheese, Coconut Curry, Red Lentil, Pasta Fagioli, Rasam, and Chocolate. 190 Adults + 45 kids = 235 attended. There was a rumor that this might be the last year… but with the support of so many helpers this year… it makes it a little easier to conceive of maybe doing it again next year. 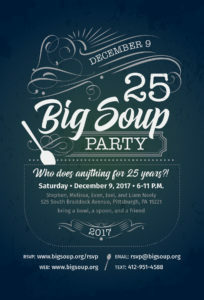 Thank you to our Soup Helpers: Laurel Beatty, Valerie Brown Merrell, Tarissa Arnold-Mages+ Josephine+ Lillian Arnold-Mages, Evan Neely, Kate Pukinskis, Michele KerrLiam Neely, Jack Barnhisel, Juddson Thomas, Samantha Levinson, and Donna Sleasman. Photos from the night: Nick Vargas from East End Studios! 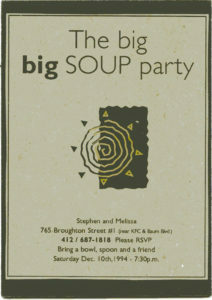 Thank you for celebrating 24 years of Big Soup with us. 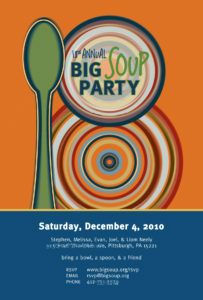 The event raised $4,500+ for the Greater Pittsburgh Community Food Bank. 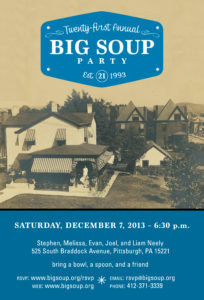 216 people attended the 24th bigsoup party. YOU ALL were amazing, generous, and a fun crowd! 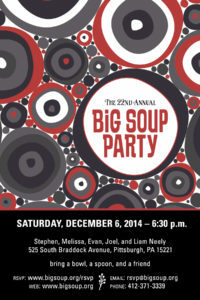 273 people (including 84 kids) attended this year’s Big Soup Party. 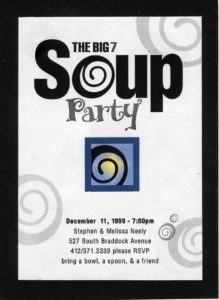 You gave $4,167.12 last night at the Big Soup Party…and an extra special donation of $6,000 in the name of soup… making the grand total $10,167.12. For every $1 given, Greater Pittsburgh Community Food Bank can turn that into $5 of food. wow! Thank you for making this a great tradition. Uncle Ralph and Aunt Missie – the furthest traveled from Texas. Nick Vargas from http://ee-studios.com for taking so many great photos. Uncle Ralph and Aunt Missie for chopping and being great soup helpers!! Valerie and Clayton for always being such a good friend and a great cook! Donna and Earl or decorating my house and helping make soup. Thank you to Juddson and Samantha, the best SOUP helpers this year. Chocolate with cherries and whipped cream. 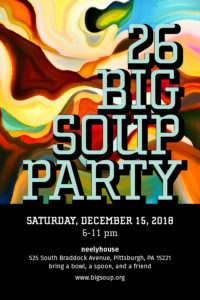 Thank you for such a fun and generous Big Soup night at the Neelyhouse! 235 people (including 87 kids) attending this years event. $2,820.98 was collected at the event and an additional gift of $6,000 was given making the grand total for the Greater Pittsburgh Community Food Bank $8,820.98! THANK YOU, Nick Vargas from http://ee-studios.com/ for taking so many great photos and helping and inspiring the go pro videos! Valerie for always being such a good friend and a great cook! Donna and Earl or decorating my house and helping make soup. Thank you to Juddson and Samantha, the best SOUP helpers this year. Uncle Ralph and Aunt Missie for chopping and being great soup helpers!! Kathryn Sitter for driving with me to OHIO for supplies!! HA. Saturday, December 7, 2013 • 6:00 – 1:30 p.m.
We would like to thank you for your generosity and heart for giving. 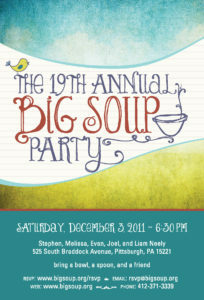 Last night, 262 Friends (85 kids) attended the 21st Annual Big Soup Party. We raised $4,012.90 at the event (plus an additional donation of $5,000) for the Greater Pittsburgh Community Food Bank. Ella won most creative bowl with her handmade tongue bowl. Jenna won for eating with the largest spoon. Deb was the furthest traveled was from West Virginia. Runner-ups were the Eileen and Jeff with “Spoon-orah” and “A-Dora-bowl”. Honorable mentions: Simon with the seashell bowl. Special thanks to James Bush and Joan Stone for arriving with the autographed photo of the “Soup Nazi” Larry Thomas. Valerie for always being such a good friend and a great cook! Zoe, Evan Neely, and Libby for crying over onions. Kathryn Sitter for bringing yummy toppings for the chocolate soup. Donna and Earl or decorating my house! Nancy and Ken for cleaning. MANY many thanks to Tim Tucker, Joseph Stamerra, and Molly D May (and friends) for playing the piano and singing and being the generous and kind musicians that you are. We were all so delighted and impressed and fortunate to have you perform at the party. Much love to you all. Thank you to Judson Thomas and Chloe Holgate, the best SOUP helpers, ever. You two rock. 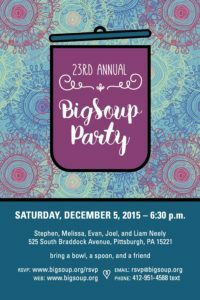 ATTENDANCE: 260 Friends (79 kids) attended the 20th Annual Big Soup Party. We made 50 gallons of soup. FUNDS RAISED: Photo from the night are on our flickr site and thanks for a great night! Thanks to everyone who contributed to the GPCFB. You raised $2,230! 193 friends (132 adults and 61 kids) made the trip to eat Black Bean with Pesto, Vegetarian Pho, Potato Cheese, Spicy Tomato, and Chocolate Soup. There were kids everywhere (and I kind of like it that way!) A lot of these kids are now teenagers… wow how they have grown up. 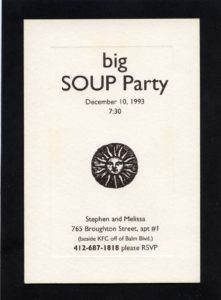 The biggest surprise of the evening was discovering the Pho soup was kicked at 8:30 and the others at 9:30! This year I could not capture photos of everyone who came to the party. 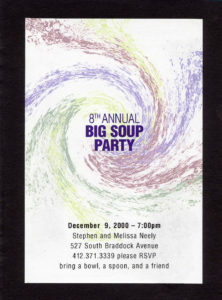 Even with the crazy snow storm that hit Pittsburgh the morning of the Big SOUP Party 2009, it was a huge success. This was our first year to be in our new house. (right next door to our old house). 151 friends (40 kids) made the trip through the snow to eat Black Bean, Potato Cheese, Tomato Lime Tortilla, Curried Red Lentil Soup and Chocolate Coffee Soup. The kids played in the snow and folks enjoyed the fire outside. The pool table in the basement was a big hit. Tim T. gave us some wonderful songs at the piano, and Jeff F. won hands down for the most original bowl. Honorable mentions here, here, and here. Thanks to everyone who contributed to the GPCFB, We raised $1420! 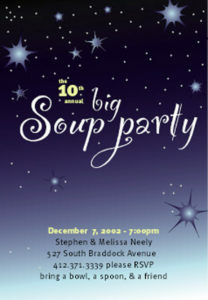 Big SOUP 2008 was frightful (the weather, that is)! The temperature dropped and at 3:00 in the afternoon the roads were icy and dangerous. By 6:00 most of the roads were drivable, but there were still many friends who were not able to make the trip in. 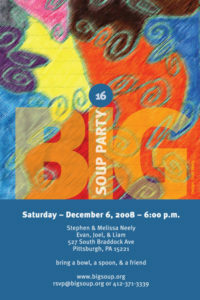 In spite of the ice and cold the 2008 Big SOUP Party set the new record for money raised for the GPCFB! We raised $1210.00 (w00t!) for the food bank. 136 friends made the trek for soup through the ice and wind (37 kids). We started the party at 6:00 PM for the first time and the last guests left at 2:30 AM. The Black Bean was the favorite of the evening. We kicked the Black Bean and the Spicy Peanut soups. Prizes were given at 9:30 for David L’s hand-carved face bowl and spoon, Noa L’s big spoon, and to Paul H. for traveling from Washington County. Michael N’s tri-bowl, Eileen F’s candle bowl, Todd’s Santa Boot bowl, Kate P’s snoopy spoon, and Kyra B’s tiny tiny bowl all received honorable mentions. 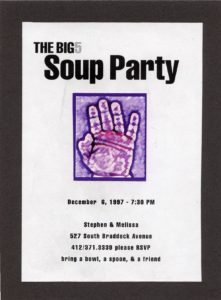 The 2007 big Soup Party started early and ended late. Judi Cagley showed up at 6:45 and Janelle B. left around 1:40 am. 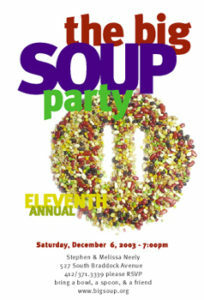 Four soups in five pots, 145 people (38 of them were children! ), $758 raised for the GPCFB. The Thai Corn Chowder was the first to go with the Chocolate Coffee Soup in hot pursuit. The Yin-Yang soup was the dominant experience of the evening. Equal time was spent discussing the taste as was spent trying to create the perfect Yin-Yang symbol in the bowl. Prizes were awarded at 9:00 to Ryan L. for his double-decker, built on-site bowl, Dr. Jeff and Eileen F. for their eco-friendly, hand carved, organic, hollowed rutabaga and pineapple bowls (respectively), to Leo Hildebrant for his square LEGO bowl, Kate Froeshl for the largest spoon used, Carmon Rinehart for his most excellent Yin-Yang demonstration, and to Laura Bentrem for traveling the farthest, from Greensburg, PA. We are so excited to have increased the collective donation to the GPCFB, more $ from a smaller crowd. MANY THANKS to everyone who contributed. 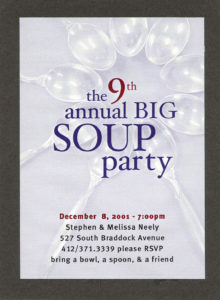 The 2006 big Soup Party was quite an evening. 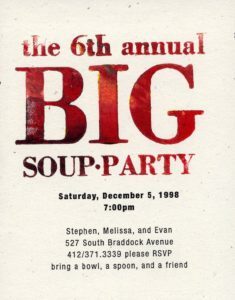 Five soups, 162 people (27 of them were children! ), $764.11 raised for the GPCFB. The Black Bean Chipotle Soup was the first to go. It was gone by 9:45. The Mulligatawny was the favorite of the evening with the Spiced Chocolate soup running a close second. 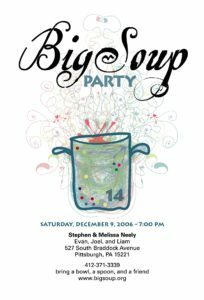 Prizes were awarded at 9:00 to Paul Rosenblatt for his tiny rowboat bowl, Eileen Freedman for her soup quote bowl, Jeff Freedman for his amazingly large end table bowl and Sebastian Tomasits for his hand-painted guitar ceramic bowl. The Hankins clan traveled the farthest from Harrisburg, PA. The largest spoon used was brought by Ryan Laib. We are so excited to have increased the collective donation to the GPCFB by nearly $300. MANY THANKS to everyone who contributed. Way to Go!! 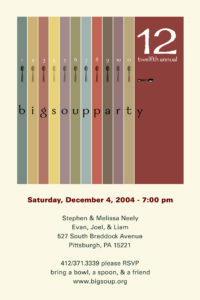 We had a great time at the 2005 big Soup Party. 135 people, $480 raised for the GPCFB. We did not kick any of the pots of soup this year, but there was not much left of any of them. 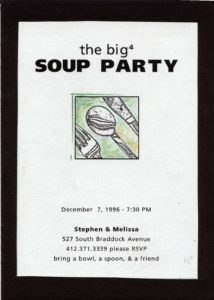 There was not a consensus on the best soup of the evening. The crowd was divided evenly between all 4 soups. The fire pit on the back deck and the singing around the piano were highlights of the evening. Jeff Freedman won most original bowl with his hand-carved log of maple bowl with matching spoon, Glenn Greene won a prize for the largest spoon used, Laura and Casey Sokol drove down from Toronto, Canada and received the award for the furthest distance traveled and we gave an honorable mention to Jackie Goldblume for her wonderful reindeer-pig bowl. 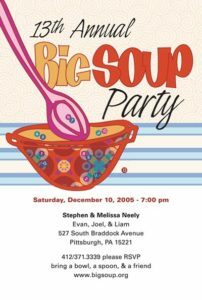 The 2004 big Soup Party was a blast! 127+ people, $346 raised for the GPCFB, the Mysore Rasam soup was “kicked” at 9:20, the Ribollita soup was gone at 11:00, and the Mulligatawny was the favorite of the evening. 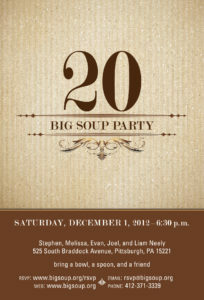 By 2:00 am, we had served about 310 cups of soup! 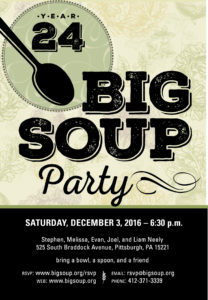 130+ people, $210+ raised for the GPCFB, the Pittsburgh Post Gazette came, we “kicked” 3 of the 4 soups, 320 cups of soup served!